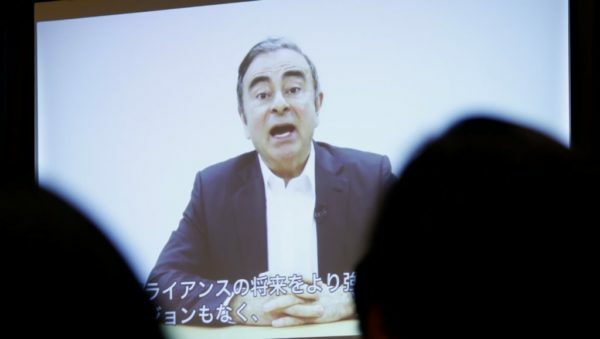 Issei Kato, REUTERS | A video statement made by the former Nissan Motor chairman Carlos Ghosn is shown during a news conference at the Foreign Correspondents’ Club of Japan in Tokyo, Japan April 9, 2019. Nissan’s former Chairman Carlos Ghosn is maintaining he is innocent and in a video released by his legal team accuses some executives at the Japanese automaker of a “conspiracy” that led to his arrest on financial misconduct allegations. Ghosn, wearing a white shirt and dark jacket, spoke calmly in a nearly 10-minute video shown at the Foreign Correspondents’ Club on Tuesday. Ghosn said the executives behind the conspiracy were motivated by what he called “selfish fears,” and mistook his leadership for greed and dictatorship.